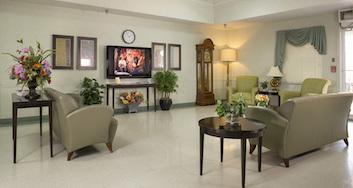 The quality that most sets Heather Manor apart from other 24-hour nursing facilities is our down home hospitality. 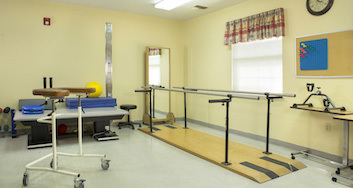 At Heather Manor we work to create a culture of respect and fun. To accomplish this, we make it a priority to provide our residents with quality care, social opportunities and events, community involvement and prioritize visits from family members and loved ones. We have a team of excellent cooks that serve breakfast each morning around 7:00am, lunch at noon, and dinner around 5:00pm each day. We also provide snacks in the morning and afternoon and upon request. Mealtimes are always a great time for socializing and family visits. We encourage residents to pursue many of the same hobbies they would at their own home including crocheting, painting and more. Our stocked library is a great place for residents to check-out reading material and keep up to date on current events from the daily newspaper. 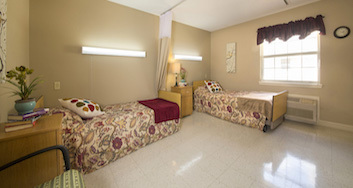 In addition, residents enjoy access to Wi-Fi, cable television, vending machines, laundry services, a private dining room for special occasions or visits, walking trails and more. We believe that encouraging everyday activities and providing comforting amenities preserves the familiarity of home. For more information on residential living, contact Heather Manor today!